Dear tourist, welcome to our beautiful city of Amsterdam. You have just finished hiring a bicycle. 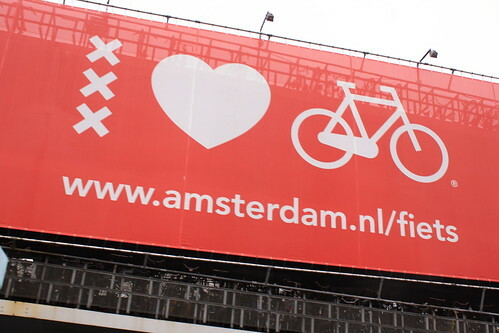 Before you go ahead and tour the streets, seeking art, drugs or a combination of both, let me give you a bit of explanation about the rules for bicycle traffic as understood by the local authorities. - You have the right to do anything you like, as long as you are sitting on your bike. As soon as you dismount, you become a normal mortal again. - Pedestrians have no rights whatsoever. Ignore them completely. - Cars are inanimate objects. Act as if they don’t exist. You will be just fine. - Signaling which way you want to turn is uncool. Bikers in Amsterdam convey their intentions telepathically. So please refrain at all times from sticking your arm out to the right, if you plan to turn right. Don't do it neither if you plan to turn left (indicating the wrong direction is even more uncool.) People will wait patientely to cross the street till they get the telepathic message you are giving off. Beware of other tourists, though: they are less fully telepathic and may cross the street even though you have just sent a powerful mind message that you wanted to go that way. Run into them. They are obsolete remnants of a bygone society. - In Amsterdam there are no such things as pavements. What you may take for a pavement or sidewalk is in fact another kind of cycling lane. - A round dark-blue sign with two white human figures on it indicates that this will be the perfect lane to attain top speed. - A green bicycle on a traffic light means that all vehicles coming from your left side have priority. - On an ordinary cycle path you should not expect to be able to cruise easily. Every time you try to do this, a young woman will track you down, come along and pass you. Then, tired from the exhausting effort of catching up with you, she will slow down right in front of you. You then have two choices: either you decide to stay behind her, in which case you will have to slow down too, or you can choose to pass her, in which case you will have to accelerate. Neither option will allow you to conserve the velocity of your own choice. - After overtaking another biker, make sure you pull back as quickly as possible in order to have him hit the brakes. It is done regularly and works miracles on the average speed. - Only scooters have more rights than cyclists. They will pass you at any time, even if their vehicle is too wide for the bicycle lane. They will especially pass you while you wait at the traffic lights, only to stop right in front of you with their motor running. Consider purchasing a dust mask. - If the rental offers scooters, take one. You will be the king of the road. You will have a wonderful network of cycling lanes all to yourself (besides a few bikers, of whom you will not have to take any notice at all). You will be allowed to park on the pavements, in front of doors and everywhere you fancy. - When you check your phone messages, make sure you slow down and lurch from side to side across the bike lane so the people behind you will know what you are doing. - At the rental, the only cycle left is equipped with those awful back-pedal brakes, while you are accustomed to hand brakes only... Take it. You won't need the brakes anyway. - In short, the basic principle is to go as fast as you can, looking neither right nor left. That's about it really. I do hope you enjoy your stay. See you again soon!